Parade Season starts May 16! Check our schedule for details! Our 62nd season starts this year! - practice season starts on Sunday Jan 7th 2018 at 5pm at the Antwerp American Legion. Please contact us if you would like to be a member of NNY's premier Drum Crops! *We practice every Sunday until Mid-may. If you want to book the Corps please do so as soon as possible - our weekends fill up quick - please see our contact page on how to contact us! Like us on Facebook! We post practice and parade info, pics, videos and upcoming events! 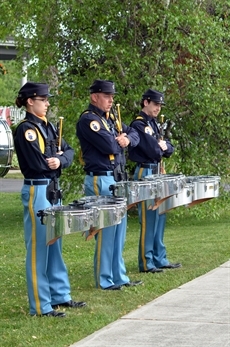 The Original Yanks Drum and Bugle Corps are a Senior Drum and Bugle Corps (Street Corps) based in Antwerp, NY. 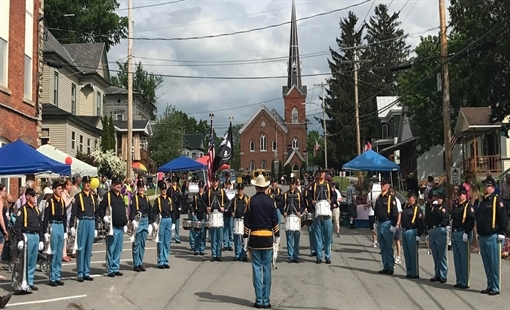 The Yanks are a mainstay of parades, festivals and concerts, with members from all over Jefferson and St. Lawrence Counties in Upstate NY. We are proud to be affiliated with the American Legion. Our signature Civil War uniforms and patriotic music make a warm summer afternoon an unforgettable occasion. 2018 is our 62nd season. We are proud to be sponsored by American Legion Post 916 in Antwerp NY. We are one of only a few Legion sponsored Drum Corps in New York State, and are proud to march in parades througout Upstate NY. We have openings in all sections! Horn players, Drumline, and colorguard. Experience not necessary, all we need is you. We provide instruments and uniforms, and there is no cost to you to join or be a member. If you would like to join our organization, please check our contact page for more information.